Indulge yourself at this top-class hotel in a superb location, where you will be spoilt with all the choices for eating, drinking, relaxing and having fun. Set in the cosmopolitan South Beach region of Miami, the property is chic and luxurious, with indulgent facilities and stylish décor. A palm-lined pool edged by elegant cabanas, a restorative spa and a great location provide a VIP experience. 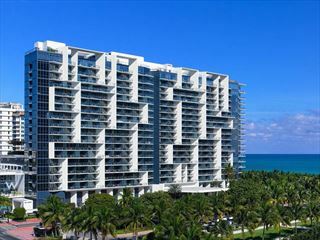 Loews Miami Beach is a wonderful fusion of Art Deco influences and South Beach style. 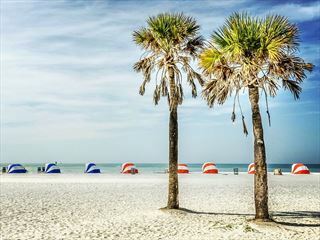 It is a glorious hotel for couples and families, with a world-class spa, a fantastic pool area and direct access to the sandy beach and South Beach boardwalk. There is an excellent selection of restaurants within the hotel, but you are likely to be tempted out by all of the eateries of Ocean Drive on your doorstep. Top Tip: The ocean view rooms are worth the supplement, and the higher the floor the better the view. Or request a city view room with balcony so you can indulge in some people watching. Prestons – with oceanviews, outdoor and indoor dining for breakfast, lunch and dinner. Family favourites alongside local specialities such as Key West Fish Tacos, Florida Lobster Nicoise Salad and Diver Scallops Pappardelle. Oceanfront oversized swimming pool, with zero-entry, great for the kids or just to lounge in. “Loews Loves Kids” programme – children’s club and amenities such as games, DVDs and kids menus. Prices correct as at 6pm on 18 Apr 2019. Please call for final price. Prices are per person based on 2 adults sharing a room. Other durations available - call for quote. Prices include flight and accommodation as stated below. For car hire and transfer options please ask your travel expert. 3 night minimum stay applies on certain dates.